Concrete work at each construction site is considered the most labor-intensive and takes a lot of time. This is the main reason for the use of modern equipment, greatly facilitating the work of builders. Concrete mixers are a reliable partner for both a professional builder and a person who owns only the superficial basics of construction. Today there are many companies that rent out this type of equipment. However, it is immediately worth noting that such a rental will be beneficial only under one condition - if you need a concrete mixer for 2 or a maximum of 3 days. In the case when the unit is needed more than once for a year or even a month, you should think about buying it. But how to choose a concrete mixer among a wide variety of its models, firms, sizes and other parameters? It is recommendations for such an important issue that this article will be devoted to. The volume of a concrete mixer is up to 100 liters. Such a unit will have an average weight of up to twenty kilograms. 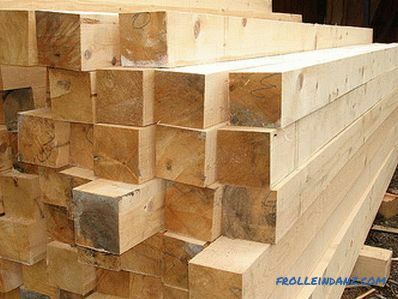 As a rule, it is used for the construction of small structures, for example, a garage, a bathhouse, a gazebo, etc. It is this model that can most often be seen in home use. The volume of a concrete mixer is up to 150 l. In this case, its weight will be in the region of forty kilograms. 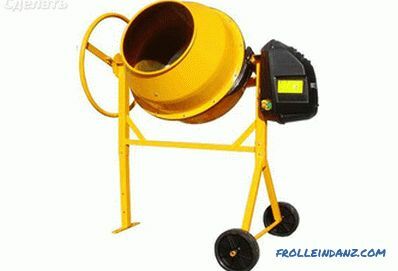 Concrete mixer with such an indicator can be safely exploited for the construction of a one-story house. 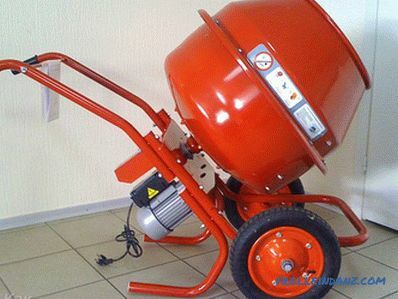 The volume of a concrete mixer is up to 300 l. The weight of this concrete mixer will be fifty kilograms and above. A higher volume of the concrete mix produced allows it to be used for the construction of three-story houses. The volume of a concrete mixer is from 300 l. In this case, the weight of the device will directly depend on its volume, but in any case, this indicator will be no less than one hundred and sixty kilograms. 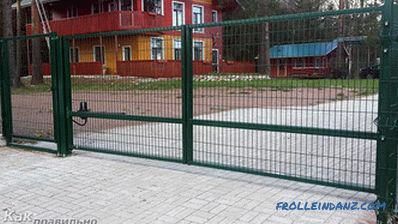 Such units are used for the construction of multi-storey buildings and the like. Moreover, it is important to make sure that concrete mixers up to 300 liters have the function of loading and unloading. Units with a volume of more than three hundred liters are equipped with a skip, it is a bucket with adjustable movement. In those cases when only the manual mechanism is used for unloading, the unit is equipped with a “steering wheel”. Power It is an important indicator to consider when choosing a concrete mixer. To determine what exactly you need, it is important to know what the expected load and time of continuous operation. 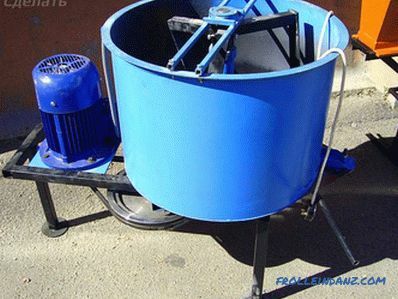 In cases where continuous operation is planned, it is best to purchase a concrete mixer with a power of 1000 watts. If the duration of the load will not exceed twelve hours, then you can buy a unit with a capacity of up to 800 watts. This factor will directly influence the kind of mixture that can be kneaded. Forced Concrete Mixer Operation rotation of the screw or blade. They are located inside the drum, which is fixed. With this installation it is possible to achieve a better operation of the unit. She easily copes with all sorts of mixtures. 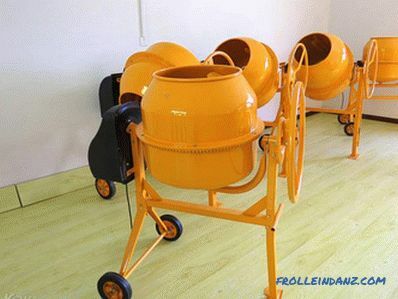 Often a concrete mixer of this type is used for large-scale construction. For example, the construction of a suburban two-story house. 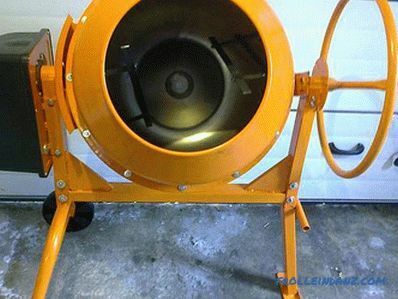 A concrete mixer of this type performs work with help spin the drum. It has fixed blades. 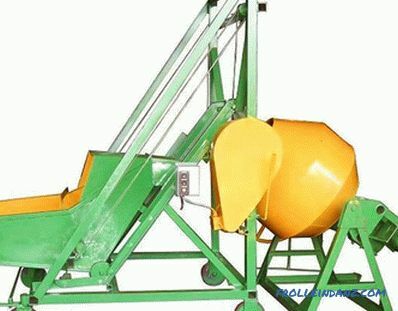 It is capable of preparing mortar and concrete mix. Their use is possible for simple homework, for example, fill the track and others. The main difference of one type of equipment from another is their device. If we talk about gear, they are, without any doubt, more reliable in operation.Their mechanism is fully protected from the penetration of sand or other debris into it, respectively, they are less prone to breakage. The main drawback of these models lies in the fact that in the event of a breakdown of the gearbox mixer, it is almost impossible to bring it into working condition. But this cannot be said of the coronary structure, which enjoys a better reputation. What does the crown mean? This is the gear that surrounds the entire drum of the concrete mixer. 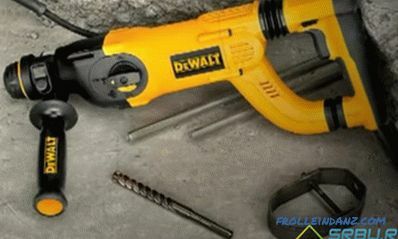 But this mechanism wears out much faster, since its device is not completely protected from the entry of construction debris. Why, then, are they more in demand? It's pretty simple. They are much easier to maintain and easily repaired with breakdowns. 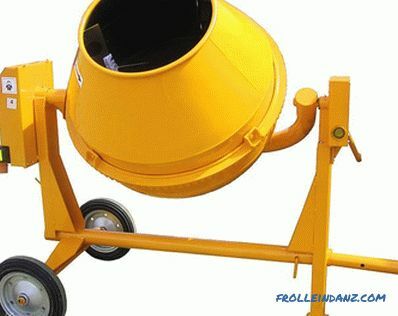 If you are inclined to this type of concrete mixers, then pay attention to the material of the crown. It can be plastic, cast iron and steel. More reliable is the crown made of cast iron. They are considered more versatile. What to choose: imported or domestic? 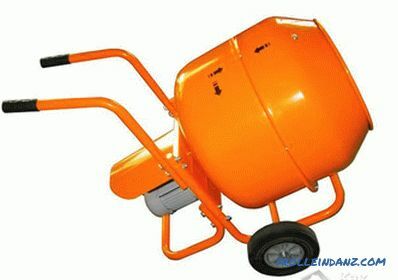 Should note that the modern market offers a wide range of concrete mixers from various manufacturers. As experts advise, it is better to give preference to imported ones, for example, manufactured in Italy, Poland, Germany, France. Despite the fact that foreign models will cost more, their lifespan compared to domestic ones will be much longer. 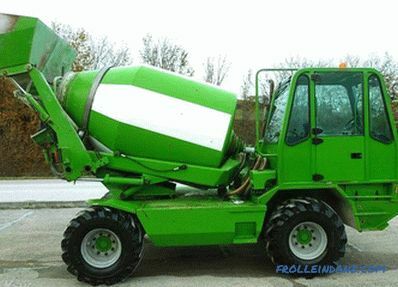 Moreover, imported concrete mixers are delivered in a complete set, which includes wheels, and this is a big plus. 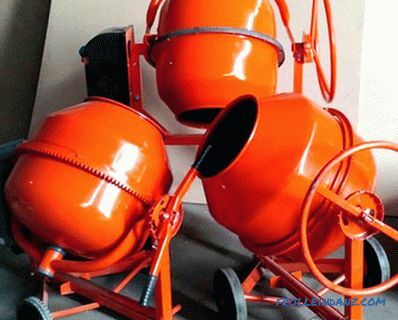 So, consider the most well-known imported brands of concrete mixers. In the current market, this model can meet most often. Despite their attractive price, they have several design flaws. For example, due to the low drum wall, some inconvenience in working with it is created. Moreover, the tilt of the drum is extremely inconvenient. As for the blades, their width is 1 mm, so when working they may be curved. But here among the advantages should be noted the long warranty period from the manufacturer, which is 3 years. This brand is produced by a Polish manufacturer. As for their shortcomings, here we should mention the inconvenient mechanism of tilting the drum, which often fails. An existing gear transmission can cause engine damage, but this is only if the drum is stuck. Among the advantages can be identified thick blades, which are almost impossible to bend. As for maintenance, it is very difficult to replace the bearing. 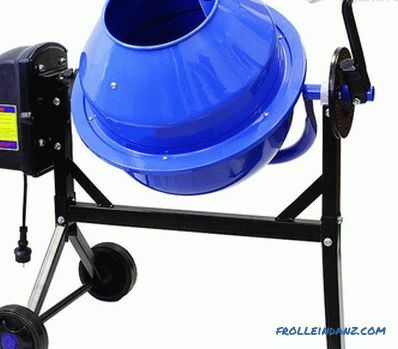 The presented model of concrete mixers is one of the best in the average price segment. 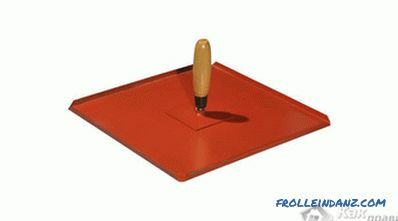 As for its advantages, the mechanism of the tilt of the drum is very convenient. Hidden springs can last for a long time. Moreover, the existing function - a multi-cycle transmission completely prevents the engine from burning out in case of jamming of the drum. This also applies to simple maintenance and repair, for example, replacing a bearing assembly is very fast. As for the price, then, unlike its competitors, it costs more, but only slightly. So, we have considered important issues related to the choice of concrete mixers, namely their principle of operation, power, volume. Knowing this, you can already make the right choice. Moreover, we saw concrete mixers of several leading manufacturers, each of them has its own advantages and disadvantages. Now the choice is yours. Most importantly, do not rush to purchase. Well, if you have already acquired it and learned something new, be sure to share your experience with us. Leave your comments, perhaps you know the models that also deserve attention. We advise you to read the article about choosing a chainsaw to give. We recommend watching a video on the recommendations of a specialist in the selection of domestic concrete mixers.